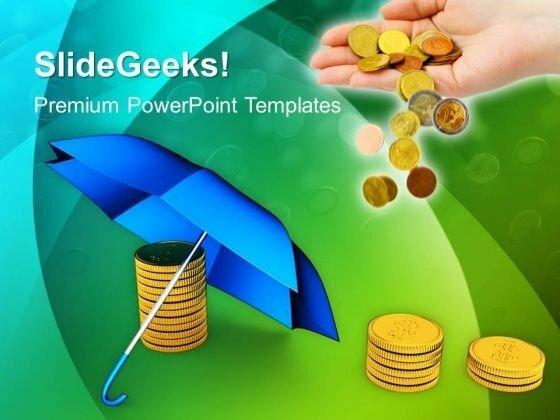 Coins Under Umbrella Finance PowerPoint Templates And PowerPoint Themes 1012-This PowerPoint Template shows you the coins under the umbrella and a hand displaying the coins openly. This template Signifies the concept of Finance, Investment etc. Clarity of thought has been the key to your growth. Use our templates to illustrate your ability.-Coins Under Umbrella Finance PowerPoint Templates And PowerPoint Themes 1012-This PowerPoint template can be used for presentations relating to-"Coins under the umbrella, money, finance, business, security, success" Emphasize points with our Coins Under Umbrella Finance PowerPoint Templates And PowerPoint Themes 1012. Download without worries with our money back guaranteee. Get rid of all fetters with our Coins Under Umbrella Finance PowerPoint Templates And PowerPoint Themes 1012. Clear all the blockades with your ideas.